This is a beautiful Trikuta temple, probably constructed during the Calukyan period. 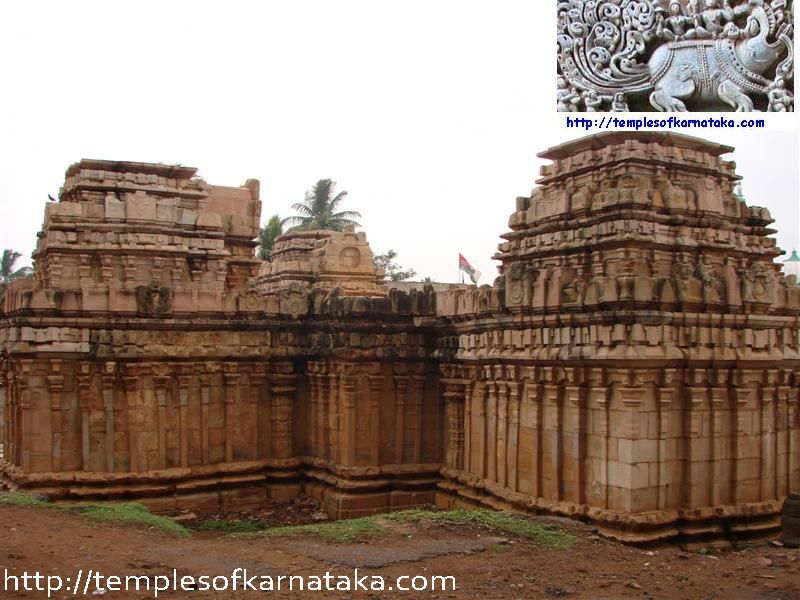 The temple faces East and it can be approached from Siddharoda Main road in Old Hubli. I was taken by surprise when I found this temple. Currently restoration work is going on and should be completed by end of 2010. The temple consists of three kuta(cellar or Garbha griha). There is an idol of Narayana facing East,a Linga facing North and Ganesha facing South. Both Narayana and Ganesha are found to be relocated to this site. You also find Sapta Maatrike, which is very beautiful and intact facing East, Shiva Parvathi and Ganesha facing North along with Adi Shakti images. I could not find any person describing about the temple, would let you know more details as I would enquire with Dharwad University, till then the name would be as Trikuta Temple at Hubli. Maintained by ARCHAEOLOGICAL SURVEY OF INDIA, Dharwad Circle, Karnataka. Hubli is well connected by Road from all over India. People travelling from Mumbai Pune can reach it by NH4. People from Southern Karnataka can approach Hubli in several good NH and SH. Hubli has an operational domestic airport which is about 10kms from the city center. Restaurant : Near Old Bus Stand one can find good restaurants, also one can find good places to eat in Kopika road, Gadag road and Station road as well. Hotel: Lot of hotels are available to stay in and around Hubli. The one next to Unkal lake is also beautiful to stay. ATM: All major banks have ATM and several branches in Hubli, so nothing much to worry about it. Transportation: To reach this temple, take an auto rickshaw and ask him to go to Old Hubli and you have to find out about this temple. It is very close to ESI hospital enroute Kalaghatagi Road. Fuel Station: Plenty of fuel stations, so do not worry about it. Health Care: Karnataka Institute of Medical Sciences is the major hospital available inside the city. Contact: You can contact Mr.Ravi at Siddharooda Matha, who is aware of this temple, he can reached on 9620271858. He can take you around the temples in Hubli and he charges very nominal and very co-operative.